Daniell said the county has met with the state and soon will be submitting an application for the permits needed to create the school entrances off Hog Mountain Road, a state route. “We don’t anticipate any problems at this time” in having the work done by the beginning of the school year, Daniell said. In other action on Monday, the Board of Education approved, with little additional discussion, the spending of $2.2 million to replace the synthetic tracks and to replace the natural turf with artificial turf at the system’s two high school stadiums. At the Jan. 22 meeting of the Board of Education, member Wayne Bagley asked about the status the work by the county on the entrances to Dove Creek. Grant, then Chief Operating Officer for the system, said it had been “his understanding” that the county would submit plans to the Georgia Department of Transportation within the first 10 days of January and that had not taken place. Grant said he then was told by Abe Abouhamdan, who is serving as Oconee County project engineer for the work, that Abouhamdan planned to submit the plans to the Georgia DOT at the beginning of February. The new elementary school is on Hog Mountain Road between Osborne Road and Dewey Road near the Barrow County line. Hog Mountain Road is State Route 53. At the meeting on Monday, Board of Education member Tim Burgess asked Grant for a status report on the road work at Dove Creek. Grant added that we “We would like to get some design information” needed to move forward with the construction of the school. Daniell said he anticipated submitting the permit materials to the state by Monday (Feb. 12) at the latest and to start advertising for a contractor, with the goal of a being able to award a contract by April 6. The county will provide the school system the needed design information, Daniell said, and that county crews will begin some preliminary work, including the straightening of Osborne Road, before the contract for the work on Hog Mountain Road was let. The Board of Education voted 3 to 0 to accept a low bid of $2,214,850 from Sports Turf Company of Whitesburg, in Carroll County, west of Atlanta, to replace the tracks at North Oconee High School and Oconee County High School and to install artificial turf at the stadium fields for the two schools. Superintendent Branch said the tracks are “deteriorating” and that there would be a “cost savings” from replacing the natural turf with synthetic turf at the same time. Board members had asked for details of the project, with much of the focus on aesthetics, at the meeting on Jan. 21. On Monday, Bagley asked for clarification about costs, and Superintendent Branch said the sports field conversions would be about $1.2 million and the track replacement about $1 million. Board Chair Tom Odom and Board member Kim Argo were absent from the Monday meeting, and Board Member Amy Parrish presided. Grant, who just moved from the position of chief operating officer to facilities director, said 97 percent of the brick work had been completed for the Dove Creek Elementary School, 95 percent of the roofing is complete, and that 65 percent of the carpeting has been installed. The four-building complex includes 48 classrooms. Brock Toole is the school system’s new chief operations officer. Grant said work on the addition of 20 classrooms at Oconee County High School is progressing. Work has begun on D Wing, with an eight classroom addition, Grant said. The next phase will add four classrooms to B hall, five science classrooms to A hall, and three classrooms to K hall. The work on D Wing is scheduled to be completed by the start of the new school year, Grant said. The Board of Education, at its meeting on Dec. 11, voted to approve a contract for $8,574,000 with Kevin Price Construction, 2500 Daniells Bridge Road, for the eight classrooms and an upgrade of the heating, ventilation, and air conditioning system at the high school. Grant said that the portable classrooms at the high school will be removed with the construction of the first 8 classrooms. Students will have access to school facilities throughout the construction project, he said. Claire Buck, school system chief academic officer, updated the Board on the pilot testing of audio enhancement technology in one classroom at each of the county’s five elementary schools. The teacher in the class has a microphone that amplifies her or his voice throughout the room “so that all of the students can hear,” Buck said. Students also have a microphone that they can use. Feedback has been favorable from teachers and students, Buck said. Buck said she is recommending that the Board expand the pilot to Dove Creek Elementary School when it opens in the fall. Buck said the system had bids from four vendors to expand the pilot to Dove Creek and that the recommendation is to approve Dooley Education Solutions, based in Athens, the current provider of the microphones in the elementary classrooms. The cost of the pilot expansion to Dove Creek is $81,997, and the vote on the bid will be before the Board at its next meeting on Feb.19. The money will come from the Education Local Option Sales Tax, Buck said. The video below is of the Feb. 5 meeting of the Board of Education. Buck’s comments on the audio enhancement pilot projects begin at 5:26 in the video. Board member Burgess asked his question about the entrances to Dove Creek at 23:56. The response of Facilities Director Grant followed. Superintendent Branch commented at 25:06 in the video. 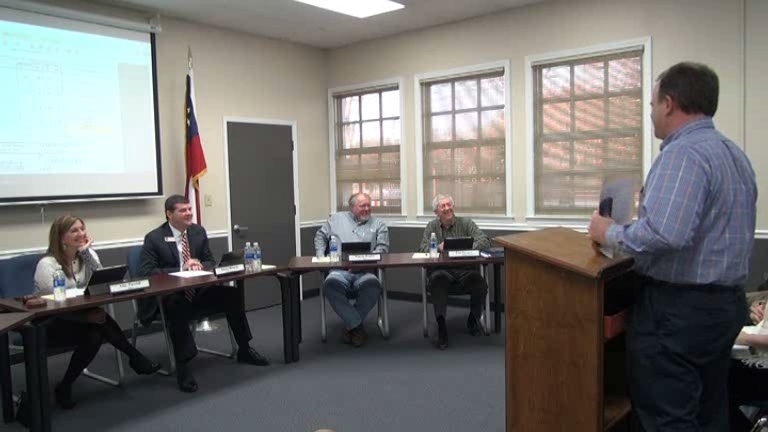 Oconee County Board of Commissioners Chair Daniell began his comments at 25:48. The vote on the sports fields is at 28:50. OCO: BOE 2 5 18 from Lee Becker on Vimeo. Why does Oconee County build schools so close to the county line? High Shoals Elementary is about a half a mile from the Walton Morgan county line and now Dove Creek Elementary is about a mile from the Barrow County line. Seems like this would add a lot of drive time for busses and cars. So there is money after all for upgrades. But new turf and roadwork come first, y'know. associated with major contractual work. Here we go again: Abe Abouhamdan is the chair of the powerful and influential Oconee County Land Use & Transportation Planning Commission. However, he also often does business with the county as the owner of ABE Consulting, and is now actually paid directly by the county ("serving as Oconee County project engineer for the work"). Not a best practice. Does not pass the smell test. This unfathomable conflict of interest began under the tenure of Melvin Davis, Daniell, Bubber and Saxon. It continues under the leadership of now commission chair John Daniell, Bubber, Saxon, Thomas and Horton. 40,000 people in Oconee give or take. Lotsa smart people here. Pretty darn easy to find an intelligent, responsible chair of the county's extremely important Land Use & Transportation Planning Commission (Jim McGarvey, Russ Page, Sarah Bell, Jane Bath, Allan Antley, David Jackson, Vickie Krugman, etc.) who DOES NOT DO BUSINESS WITH OCONEE COUNTY! Jon Williams from Williams and Associates, a land planning and engineering firm at 2470 Daniells Bridge Road, asked the Board to make changes in the Landscape and Buffers section of the Unified Development Code at the Jan. 23 Town Hall Meeting held at the Community Center in Veterans Park. He has given the Board a list containing the signatures of Abe Abouhamdan from ABE Consulting, Bob Smith from Smith Planning Group, Ken Beall of Beall and Company, and Stuart Cofer of Cofers Home and Garden, among others, endorsing the change. So Abe, when you signed this endorsement, were you representing Abe Abouhamdan from ABE consulting, or Abe Abouhamdan, Chairperson of the Oconee County Land Use & Transportation Planning Commission??? Pick one or the other. Enough is enough John Daniel, Bubber, Saxon, Horton and Thomas: Give Abe a choice to A)represent the county without any potential conflicts of interest, or B) do business for financial gain with Oconee County. Can't blame Melvin any more for this. Our five commissioners know better; end this farce. If OCS did not slap schools on a state highway, they would not have to wait on the state to approve their entrances. Plenty of open land in this county that does not touch a state highway. Also, it is nice to hear about the $80K for audio updates in the schools. Too bad they cannot afford desks for students. Hopefully the new school will have them.